Can you read the words under "Tanner"? If so, we could Google it and see if we can find any information on THAT building. It almost looks like some type of farm building, like a grain elevator or something. I looked really closely, then used yahoo and google to search Tanner Waden Rises, then I looked even closer and decided maybe some letters faded so I looked up Tanner WAREHOUSES (you can see it ends in 'ses' and starts with 'wa*e'. And all I found was that there's a Tanner Alabama. Probably dosn't help at all, but thought it would save someone else the trouble since there's no useful results. 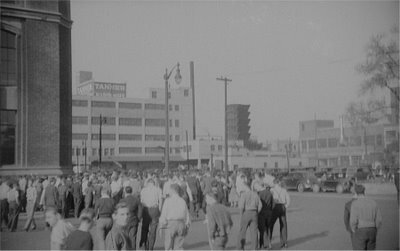 But I'm sure that one building says "Tanner Warehouses", with the 'o' faded away. I also looked really close at the photo and it appears to me to read "Waden Rises" or "Waden Hoses." Thus, "Tanner Warehouses" is probably correct. Still don't know where it is/was located though. The odd-shaped building looks like a water cooling tower. The old power plant in Gainesville, FL has several of them. 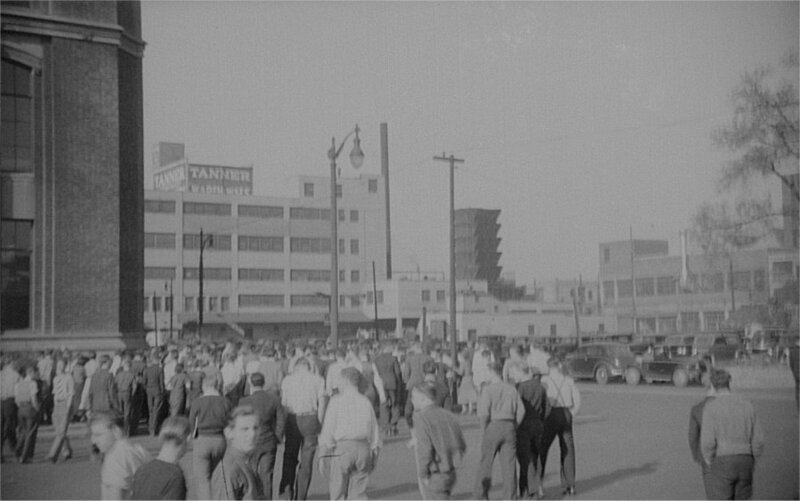 There was a "Tanner Fireproof Warehouses, Moving and Storage Co" located at 2510 3rd AVenue in Detroit, just north of Henry Street. Maybe that is the northeast corner of Cass Tech High School, and you are looking northwest toward Tanner? Mike M. - You are correct! How do you know that? Do you know what the odd shaped building is in the center of the photo? My family has been in Detroit for over 80 years and no one recognizes that building. In fact, my Dad went to Cass Tech in the 1950's and didn't recognize anything in the photo let alone the strange building. I'm pretty sure everything in the photo, with the possible exception of the school building, no longer exists. I have an old Polk's Detroit City Directory from 1940. That's how I found the Tanner address. From the shadows I guessed we were looking northwest. The edge of building looked familiar and on a hunch I searched for a picture of Cass Tech to compare, and the windows matched. I think Cass bordered on an older close-in industrial area but I don't know what the odd-shaped structure is. I suspect a lot of what you see was cleared during the building of the Lodge Expressway. thats so awesome! you found it!